On the night of Mizik Ayiti, Clocktower Radio releases a cassette mixtape of archived Radyo Shak recordings from their pirate radio station during the Ghetto Biennale of Port-au-Prince. 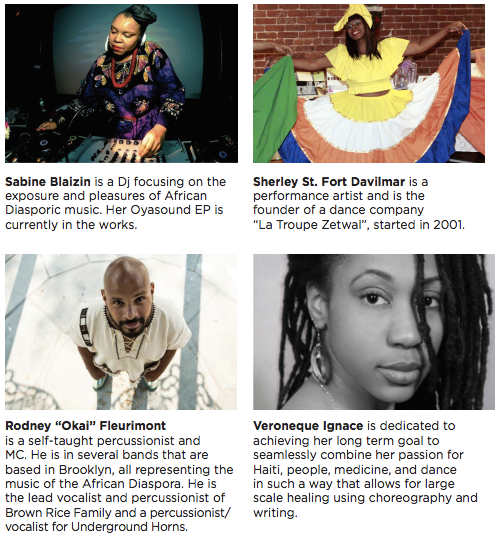 The recordings are in both English and Kreyol, and include snippets of slam poetry, traditional Haitian recipes, historical tales, interviews with biennale artists, Rara street festivals, twoubadou crooners, and all vinyl DJ sets. In rural Haiti, the Lakou communal living system embodies the intersection of land, family, and spirituality. Lakou members develop reciprocal patterns of resource sharing and jointly work the land. 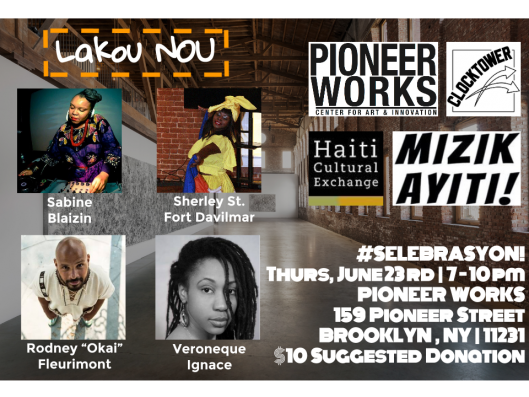 Lakou NOU (“Our Yard: in Haitian Creole), HCX’s newest program, will provide four artists of Haitian descent with the opportunity to create and present new work by connecting their skills and talents to four traditionally under-served Brooklyn neighborhoods, home to generations of Haitians and Haitian-Americans: Crown Heights, Canarsie, East Flatbush, and Flatbush. This entry was posted on Saturday, May 14th, 2016 at 11:43 am	and is filed under Arts, Crafts, Dance, Events, HCX Collaborations, HCX Programs, Literature, Mizik Ayiti, Music, Photography, Poetry, Public Forums, Selebrasyon!, Visual Art. You can follow any responses to this entry through the RSS 2.0 feed. You can leave a response, or trackback from your own site.